The NRAO is organizing a one-day workshop on Monday, 4 January 2016 – immediately prior to the American Astronomical Society meeting in Kissimmee, Florida – to discuss the scientific motivation and technical concept for a next generation Very Large Array (ngVLA). Discussion of ngVLA synergies with other science facilities, such as the Atacama Large Millimeter/submillimeter Array, James Webb Space Telescope, High Definition Space Telescope, Square Kilometre Array, and Thirty Meter Telescope. Please visit the ngVLA Workshop 2016 website for additional information: five wide-ranging science white papers are available in the ngVLA memo series and on arXiv. An ngVLA web discussion forum has been initiated, and the detailed program is nearing completion. We request attendees register at the Workshop website so that we can adequately plan for seating and refreshments. Registration is free and is not required to attend. We look forward to seeing everyone in Kissimmee on Monday, 4 January 2016! The Observatory has completed the Semester 2016A time allocation process for the Very Large Array (VLA), the Very Long Baseline Array (VLBA) / High Sensitivity Array (HSA), and the Green Bank Telescope (GBT). A total of 324 new proposals were received for the 3 August 2015 submission deadline. In aggregate, the proposals covered a broad spectrum of modern research in astronomy and astrophysics. The proposals were reviewed for scientific merit by eight Science Review Panels (SRPs) and for technical feasibility by NRAO staff. These reviews were completed in September 2015 and then considered by the Time Allocation Committee (TAC) at a face-to-face meeting on 19-20 October 2015 at NRAO in Socorro, NM. The TAC consists of the SRP chairs and was charged with recommending a science program for Semester 2016A to the NRAO Director. The recommended program was reviewed and approved on 4 November 2015. A disposition letter was sent to the Principal Investigator and Co-Investigators of each proposal on 13 November 2015. A TAC report containing information for proposers and observers, including statistics and telescope pressure plots, was released the same day. The approved science program has been posted to the NRAO science website. For each approved proposal in the science program, the Proposal Finder Tool will have access to its authors, title, abstract, and approved NRAO hours. We would like to remind our users that the Student Observing Support program resumed for 2016, as announced in the July 2015 NRAO eNews. We encourage Principal Investigators on successful NRAO observing programs to consider applying for support. The Observatory welcomes community feedback on its proposal review and time allocation process. Please provide such feedback via the Proposal Review department of the NRAO Helpdesk. The NRAO announces that it will be proceeding with the highly anticipated All-Sky portion of the Very Large Array Sky Survey (VLASS), subject to the successful passing of its preliminary and critical design reviews in 2016. This decision follows the recommendation of the VLA Sky Survey Community Review panel, who judged the VLASS All-Sky tier to be well-matched to: (a) groundbreaking transient and polarization science that will be enabled as soon as the first tranches of data products are released; and (b) the desire for user-friendly data products. The panel assessed that the proposed new VLASS would be a clear advance over the NRAO VLA Sky Survey (NVSS) and the Faint Images of the Radio Sky at Twenty-one centimeters (FIRST) survey in terms of area, frequency, and angular resolution. VLASS will be a three-epoch (32-month cadence), all-sky, S-band (2-4 GHz) continuum polarimetry survey with 2.5-arcsecond spatial resolution. The survey will span seven years and six VLA configuration cycles. The total VLA telescope time required for the survey is ~5400 hours, or ~900 hours per configuration cycle. Pilot observations will be acquired in the B-configuration in summer 2016 to support the critical design review. Observations for the full survey are expected to begin in October 2017, with quick-look images produced within 2 weeks of observation and final images and catalogs available for the first half of the first epoch available from the archive on or before February 2019. The basic data products currently anticipated include raw visibility data, calibrated data, quick-look images, and more (see Table 7 in the February 2015 VLASS Proposal). Over the next few months, NRAO will establish the VLASS Project Office. We will also complete the detailed planning and technical testing needed for observations to commence. In the coming months, NRAO will publish a call for the community to contribute ideas and resources for the development of Enhanced Data Products (EDPs) from the survey, which will be considered at the preliminary design review. These potential EDPs include transient object catalogs and alerts (enabling synergies with Large Synoptic Survey Telescope science), full spectral resolution image cubes, and catalogs of multi-wavelength associations to VLASS sources, and more. We thank Stefi Baum and Eric Murphy for leading the Survey Science Group Governing Council for the VLASS proposal to date. The NRAO VLASS Project Office will continue to consult the Survey Science Group during the survey implementation and seek the Council’s assistance in communicating the survey’s compelling scientific opportunities to the community. The fifth Jansky Very Large Array (VLA) Data Reduction Workshop will be held 14-18 March 2016 in Socorro, NM, USA. The main goal of this workshop is to assist observers with the challenges of Jansky VLA data reduction posed by the increased flexibility and complexity of the instrument. NRAO staff will provide lectures on various topics, and allow participants to reduce some fraction of their own data with local expert staff in attendance for consultation. Please note that this is an advanced workshop and, unlike our summer Synthesis Imaging Workshops, not intended for those who are new to radio interferometry. Prior experience with AIPS, CASA, or MIRIAD is required. As we will be using CASA as our main data reduction package, a working knowledge of it would be helpful. To register, and for more information we refer to the Workshop web page. Space is limited, and registrations are coming in at a steady pace. We look forward to welcoming you to Socorro in March next year! The 15th Synthesis Imaging Workshop will be held 1-8 June 2016 at the NRAO and New Mexico Institute of Mining and Technology in Socorro, NM. The Workshop will comprise a week of lectures on aperture synthesis theory and techniques at a level appropriate for graduate students in astrophysics. The Workshop will also include two days of practical tutorials demonstrating data collection, calibration, and imaging of data from the VLA, ALMA and the VLBA. Registration is expected to open in early February 2016. ALMA finished its Cycle 3 programs for the C36-8 and C36-7 configurations, and the array is now moving into C36-1 for observations commencing 23 December. There was excellent observing success in these non-standard modes, as detailed on the ALMA Status Page. 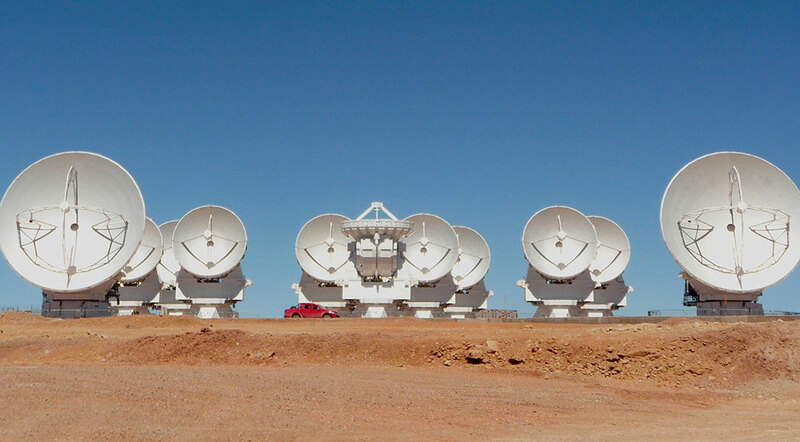 A new installment of ALMA Test data is available. This release contains data on Pluto taken in support of the NASA New Horizons Mission. 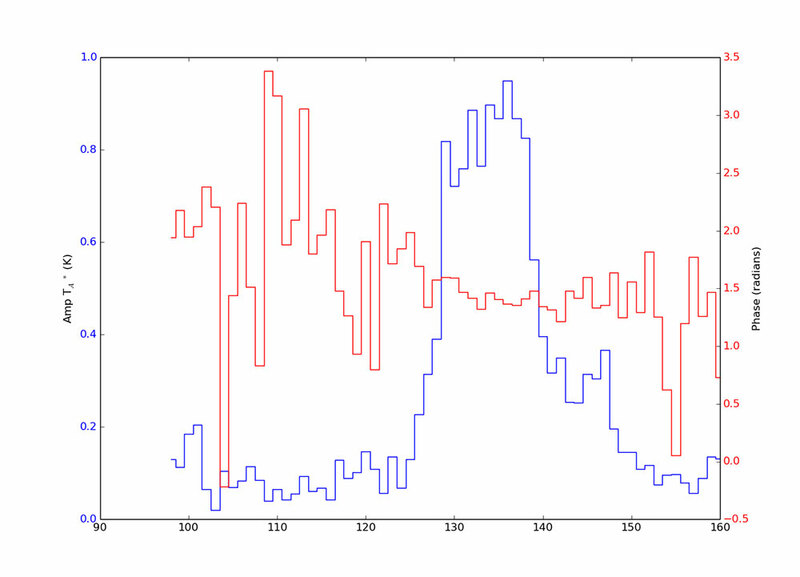 These data were taken as "test data" and contain basic scripts for calibration and imaging. Five epochs of data were released. A new installment of Science Verification data is planned for release on 21 December 2015, including the Science Verification target IRAS16293-2422, consisting of spectral line observations with the 12-m Array demonstrating ALMA's Band 4 (125-163 GHz) capability, including lines of CH3CN and CH3OH. For details, please see the pre-announcement. Registration is now open for Molecular Gas in Galactic Environments, a four day Workshop to be held 4-7 April 2016 in Charlottesville, Virginia by the North American ALMA Science Center (NAASC). Please register and submit abstracts for this Workshop, which focuses on the character of molecular gas identified in various extragalactic environments. North America issued a Call for Proposals for ALMA Development Studies on 16 March 2015. Study proposals were due 12 June 2015. A panel of highly qualified members of the astronomical community reviewed the study proposals. To avoid conflict of interest, none of the review panel members are affiliated with NRAO. Panel members submitted anonymous grades and rankings. The panel discussed the results of the rankings in a tele-conference. Seven Studies from 33 proposers representing ten institutions fit within the funding envelope and were proposed for North American funding with the consent of the National Science Foundation. improving performance and evaluation of ALMA's SIS mixers. The proposed program is described in the following table. Catherine Vlahakis has joined the NAASC, coming from the Joint ALMA Observatory in Santiago where she spent several years serving as ALMA EOC Deputy Program Scientist and as Commissioning Scientist. Her scientific interests include studying the properties of the interstellar medium and star formation in galaxies using (sub)millimeter and radio observations. A workshop was held in Green Bank on 21-23 September 2015 to survey the range of high-frequency science made possible with the existing and new Green Bank Telescope (GBT) instruments. The goal of the workshop was to come to an understanding of the role of the GBT in research, instrumentation development, and hands-on training for the scientific community in the era of the Atacama Large Millimeter/submillimeter Array and the Jansky Very Large Array. The more than 50 participants discussed topics including astrochemistry, star formation, molecular gas in galaxies, and the Sunyaev-Zel’dovitch Effect in galaxy clusters. There were also presentations on the GBT high frequency performance, the 3mm weather in Green Bank, as well as current and future instrument development. The workshop program and many of the presentations are available online. Amplitude of the cross-correlation between each array element and the reference element at row 2, column 3, pointed at the Orion SiO maser source. To accentuate the appearance of the antenna Airy disk, the Y axis is shown for a scale of -10 to 40 K. The reference pixel is shown offset with its full-scale of 0 – 400 K.
The cross-correlation amplitude (shown in blue) and phase (shown in red) of element in row 2, column 8 (where the cross-correlation signal peak amplitude is less than 1K) with respect to the reference pixel. The Phased Array for Millimeter Astronomy (PHAMAS), a W-band focal plane phased array receiver covering 70 – 97 GHz, was installed on the GBT for tests in late October 2015. The array will eventually have 64 elements, and be able to synthesize up to 225 Nyquist-sampled beams on the sky in a single pointing. These beams are formed by vector summing combinations of the individual elements, to best match the focal plane Airy disk. In its initial form, PHAMAS has 38 working elements – set by the number of IF fibers to the GBT control room – which is adequate to evaluate the operation on the GBT. The array uses cryogenic MMIC preamplifiers in a compact dewar, with further gain and down-conversion done with room temperature electronics. The entire cluster of 64 feed horns is 48 mm square, as is necessary for proper focal plane sampling of the GBT f/1.9 optics. Tests showed that we could easily calibrate the array phase and gain response (convolved with the telescope response) by observations of Mars, 3C454.3, and Orion SiO masers. The convolved response is used to compute cross-correlations between elements, which are then used as weights in the vector sums of elements. We were also able to measure the absolute phase and gain response of the array with a noise source mounted on the prime focus boom, and this, along with the sky calibration, means we can quickly measure the GBT surface errors, since the calibration function is equivalent to a holography map. Figure 1 shows the cross-correlation of every element amplitude against the reference element, which was pointed towards the Orion SiO maser point source. The reference element is seen as the second row from the top and third column from the left. The data shown is for 30 seconds integration for each of the ON and OFF positions. Missing grid elements are due to elements that were turned off for this experiment. The y-axis of the plot is the TA* scale in Kelvin. Preliminary analysis showed system temperatures in the range 150 – 180K, and aperture efficiencies well in line with expectations. The X-axis is in frequency channel space and covers a bandwidth of ~6 MHz. The first nulls of the Airy disk in the focal plane are expected to be separated by approximately three elements, but the surface was not set for these observations so we expect a more complex focal plane function. Figure 2 shows a plot of the row 2, col 8 element cross-correlation showing that we are picking up structure in the weakest location in the focal-plane, which in intensity units is 4x10-6 times as strong as the central position. The minimum intensity sidelobe required for efficient beamforming is ~200x larger than this, so we have adequate noise margin to calibrate on much weaker sources. These initial engineering observations are exceptionally encouraging. To our knowledge, this is the first ever demonstration of an astronomical, focal-plane phased array feed working at millimeter wavelengths. These results show that such an instrument, capable of forming hundreds of simultaneous beams, fully spatially sampling the sky, is completely realistic. Unlike a conventional feed-horn array, such an instrument would be able to intrinsically correct for phase errors due to large-scale surface deformations, which are a significant component of the GBT surface error budget at high frequency. These first results from the October commissioning run demonstrate the basic operation of the instrument. The next stage is to generate the equivalent formed beams for these observations. Although conceptually well understood, this is a formidable data processing challenge. The next steps for the instrument are to enable all 64 elements, and to develop a wideband beamformer. We acknowledge the GBT engineering staff for their considerable assistance in the preparation and execution of this experiment. This work was funded by the NSF under grant AST-1106205. The U.S. Virtual Observatory Alliance (USVOA) is a U.S.-wide open collaboration endorsed by the American Astronomical Society (AAS) to expand and promote VO tools and services. The USVOA is also the U.S. project of the International Virtual Observatory Alliance (IVOA), the global effort to facilitate VO standards and goals. The USVOA will hold its next annual face-to-face meeting on 6 January 2016, from 10:00 - 11:30am at the AAS meeting in Kissimmee, Florida. We will report on both U.S. and international activities for the past year, and describe planned initiatives for the coming year. We will solicit questions and concerns, and will work to answer or resolve them where we can, and will carry items related to the international project to the IVOA for further discussion. We encourage everyone interested to attend, from those who are casually interested to those more directly embedded in VO developments. NRAO is now accepting applications for its 2016 NRAO Summer Research programs. In each of these programs students conduct research under the supervision of an NRAO staff member at one of the NRAO sites on a project in the supervisor's area of expertise. The project may involve any aspect of astronomy, including original research, instrumentation, telescope design, or astronomical software development. At the end of the summer, students present their research results at a seminar and submit a written report. These projects may result in publications in scientific journals. In addition to their research, students take part in other activities, including social events, excursions, professional development workshops, and an extensive lecture series that covers many aspects of radio astronomy and astronomical research. Students may also collaborate on their own observational projects using the Jansky Very Large Array, Very Long Baseline Array, and/or Green Bank Telescope. Students are encouraged to review the NRAO staff web pages to learn more about the types of research being conducted at the NRAO. On their application, students have the option of requesting to work with a specific staff member, on a specific scientific topic, at a specific site, or to be considered for a specific program. The site to which a summer student is assigned depends on the location of the NRAO supervisor who chooses them. Examples of past summer student research projects can be found on-line at the NRAO Summer Student website. 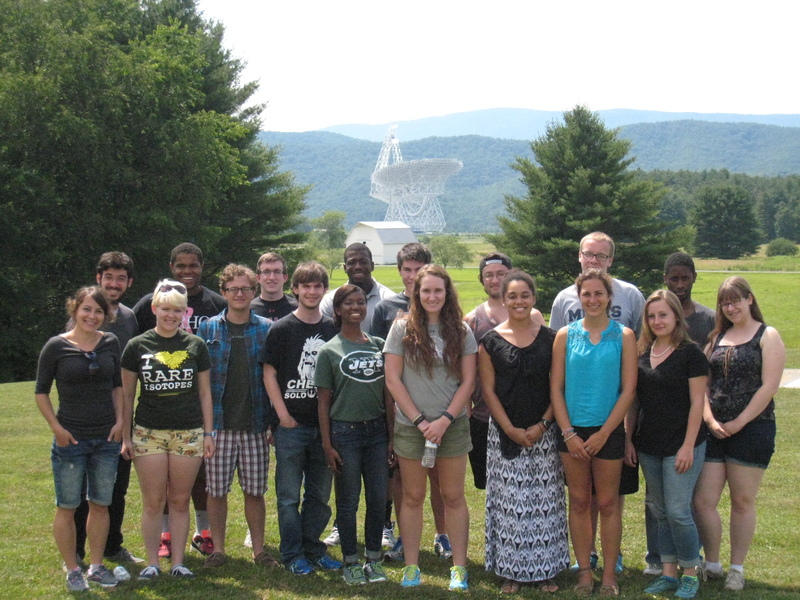 There are several types of Summer Student programs available at the NRAO for undergraduates and graduate students, and more information about each, as well as the application form, is available online. The programs run 10-12 weeks each summer, from early June through early August. The stipends for the 2016 Summer Student Program will be $657 per week for undergraduates and graduating seniors, and $703 per week for graduate students. These stipends include an allowance for housing, since housing is not provided at most sites. Financial support is often available for students to present their summer research at an American Astronomical Society meeting, generally at the winter meeting following their appointment. We strongly encourage applications from members of underrepresented groups to all of our programs. NRAO has a commitment to broadening participation in Science, Technology, Engineering, and Mathematics (STEM) fields by providing an inclusive, educational and exciting experience for everyone. All students with an interest in astronomy and a background in physics, astronomy, engineering, computer science, and/or math are eligible. The same online application form and process is used for all summer programs. Required application materials include the on-line application form (including a statement of interest), transcripts, and three letters of recommendation. The deadline for receipt of all application materials is Monday, 1 February 2016. Sinclaire Manning first came to the attention of NRAO astronomer Aaron Evans when she applied for a Research Experiences for Undergraduates (REU) summer internship in 2012. That summer at NRAO headquarters in Charlottesville, Virginia, provided Manning with her first glimpse into the world of research, and what it was like to be a professional astronomer. Manning’s summer experience also coincided with the nascent steps toward the development of NRAO’s National Astronomy Consortium (NAC) program: an internship program designed to attract underrepresented students to astronomy and related fields and build long-term mentoring relationships that lead to successful academic and professional careers. 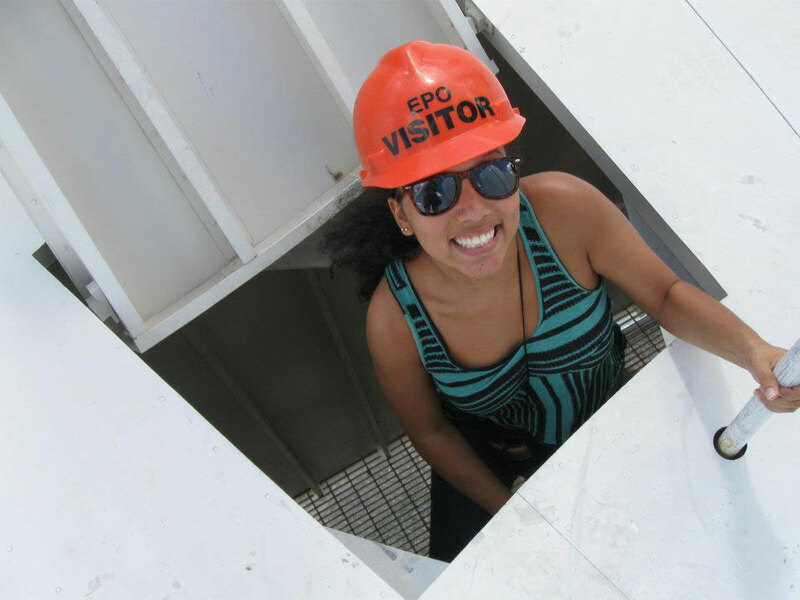 Manning found that while the learning curve was incredibly steep, her 10-week internship at NRAO as a rising junior was an overwhelmingly positive experience and solidified her decision to pursue a career in astronomy. The experience was so positive for both Manning and Evans that she returned to NRAO for a second summer in 2013, and was part of the 2014 NAC cohort at the University of Wisconsin–Madison (a NAC partner). Now an astronomy graduate student at the University of Texas-Austin, Manning credits Aaron Evans and her advisor at Howard University (a NAC partner), Marcus Alfred, with providing research opportunities and important, ongoing mentoring support. Manning reports that Evans wrote letters of recommendations for REUs, graduate school applications, and, most recently, her NSF Graduate Research Fellowship application. The long-term mentoring assistance by Evans and Alfred highlighted for Manning the value of the NAC program’s mentoring model in a field that does not feature a large number of people from underrepresented backgrounds. Their example has encouraged Manning to serve as a mentor with the NAC and a new summer research initiative at the University of Texas-Austin. Manning is working with Dr. Caitlin Casey on understanding the formation and evolution of dusty star-forming galaxies at high redshift. She will be conducting a large-scale morphological analysis of z~1-3 obscured galaxies and then using this analysis to distinguish between AGN and starburst-driven radio emission. 135.01 Formaldehyde in Absorption: Tracing Molecular Gas in Early-Type Galaxies. Niklaus M. Dollhopf; Jennifer Donovan Meyer. 141.05 Probing Solar Wind Turbulence Using JVAS and VLA Calibrator Sources. Sarah Betti. 141.20 Chemistry of the Upper Atmosphere of Neptune. Elizabeth Nance. 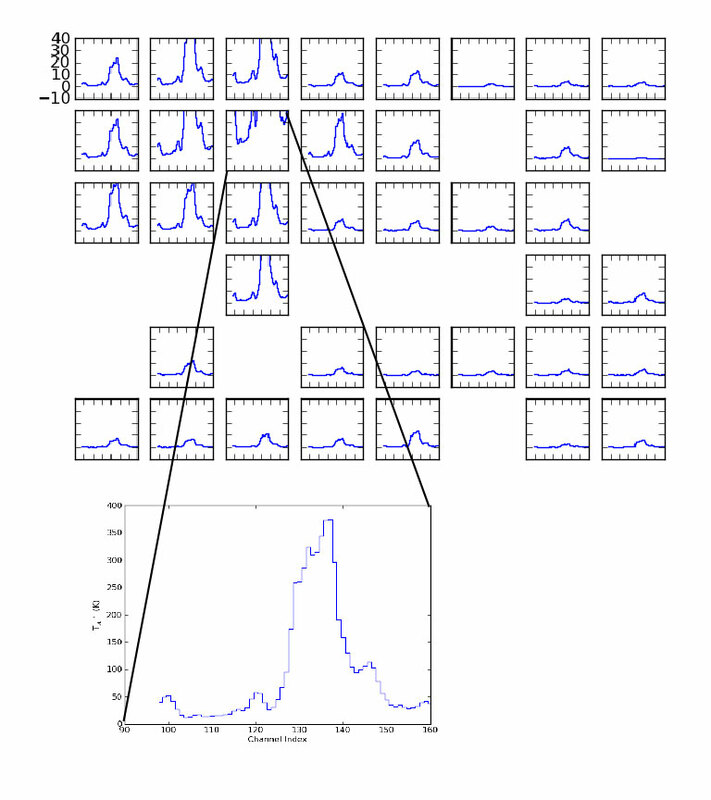 241.03 The Optimization of GBT Pulsar Data for the GBNCC Pulsar Survey. Ashlee N. Gordon. 241.06 Shedding Light on the Eclipses of PSR 1748-2446A. Christopher Bochenek; Paul Demorest. 243.22 Searching for Super Massive Binary Black Holes in the VLBA Calibrator Survey. Brittney C. High; Alison B. Peck; Anthony J. Beasley. 243.38 Jansky VLA Imaging of Heavily Obscured, Luminous Quasars at Redshifts~2. Adam Trapp; Carol J. Lonsdale; Palavi Patil. 249.07 Applying the Principles of Systems Engineering and Project Management to Optimize Scientific Research. Adria J. Peterkin. 249.08 The Value of Methodical Management: Optimizing Science Results. Linnea Saby. 302.06 Characterizing Supernova Remnant and Molecular Cloud Interaction Sites Using Methanol (CH3OH) Masers. Bridget McEwen; Ylva Pihlstrom; Lorant Sjouwerman. 341.02 Studying Star Formation in the Central Molecular Zone using 22 GHz Water and 6.7 GHz Methanol Masers. Matthew Rickert; Farhad Yusef-Zadeh; Juergen Ott; David S. Meier. 341.05 GBT Search for HI Clouds Tracing the Nuclear Wind of the Milky Way. Kevin C. Harrington; Felix J. Lockman; Naomi M. McClure-Griffiths. 341.06 Widespread Hot Ammonia in the Central Kiloparsec of the Milky Way. Tierra Candelaria; Elisabeth Mills; David S. Meier et al. 341.09 Estimating Circumnuclear Disk temperatures using ALMA data. Kevin Gima; Elisabeth A. Mills; Viviana A. Rosero et al. 341.14 Probing Metallicity across the Milky Way Disk with the VLA. Jonathan Barnes; Dana S. Balser; Trey Wenger. 342.26 CSS Object Found in Galaxy Merger 1015+364 at 2.3 and 8.5 Hz. Antonio J. Porras; Sarah Burke-Spolaor. 346.01 [NII] 205 μM Line Emission Detection in High Red-shift Galaxies. Michelle Nowling. 346.05 The Circumnuclear Starburst Ring in NGC 1097. Beverly Thackeray-Lacko; Sabrina Stierwalt; Kartik Sheth. 346.09 Star Formation Rate in The Solar Neighborhood and Beyond. Bridget Kayitesi; Amanda L. Heiderman. 346.15 The Spatial Distribution of Large and Small Dust Grains in Transitional Disks. Elizabeth Gutierrez; Laura M. Perez. 347.05 Physical Conditions in the Molecular Gas of the Local Group Dwarf Starburst, IC 10. Lauren E. Bittle; Kelsey E. Johnson; Adam Leroy et al. 349.18 A 6 GHz Synoptic Survey of the COSMOS Deep Field with the JVLA. Joseph R. Sink; Steven T. Myers. Central Development Laboratory Director: The NRAO is now accepting applications for the position of Director of the Central Development Laboratory (CDL) in Charlottesville, VA. The CDL has a long history of developing new technology to enable forefront research in radio astronomy by the scientific community. The new Director will provide the vision and leadership to continue this tradition, and to address the key technical challenges of the next generation of instruments while maintaining the performance of current NRAO facilities at the state of the art. Research Associate: The NRAO is accepting applications for a Research Associate in Pulsar Astrophysics either at headquarters in Charlottesville, VA with Scott Ransom, or at the Array Operations Center in Socorro, NM with Paul Demorest. This position is one of several postdoctoral positions that are funded through the newly established North American Nano hertz Observatory for Gravitational Waves (NANOGrav) Physics Frontier Center (PFC); see http://www.nanograv.org. The goal of the NANOGrav PFC is to detect low-frequency gravitational waves and characterize the low-frequency gravitational wave universe through radio timing observations of pulsars. Assistant Director for Science Support & Research: The NRAO invites applications for the position of Assistant Director for Science Support & Research. The successful candidate's principal responsibilities will be to lead and manage: (a) the NRAO time allocation and proposal handling process; (b) the observatory's interfaces to the international user community; and (c) the NRAO scientific staff. This position will be based at the NRAO research facilities in Charlottesville, Virginia or Socorro, New Mexico. Consideration of applications will begin 15 January 2016. Research Associate: The NRAO invites applications for a post-doctoral research position in galaxy evolution at the North America ALMA Science Center (NAASC) in Charlottesville, VA. The successful applicant will work under the supervision of Dr. Eric Murphy on the multi-wavelength analysis of data from the Jansky Very Large Array (VLA) Frontier Field Public Legacy Survey. The focus of this post-doctoral position will be incorporating new, extremely deep, sub-arcsecond, multi-frequency (full polarization) VLA data in the Hubble Space Telescope/Spitzer Frontier Field Program. 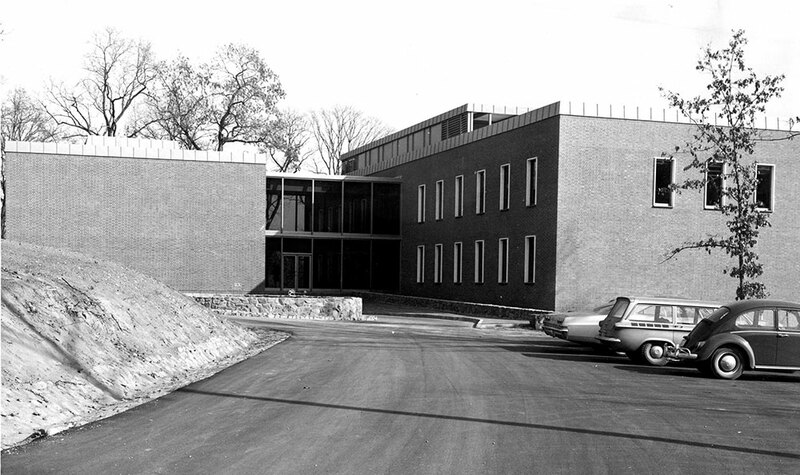 About this month's photograph: Fifty years ago, on 20 December 1965, NRAO took occupancy of the Edgemont Road building in Charlottesville. This photo from 15 January 1966, taken by the construction contractor, R.E. Lee, shows the building at the point that NRAO staff were beginning to move in, bare of landscaping and without the "Jeffersonian" columns that were added during the 2004-2005 building expansion. The Request For Proposal for the building was issued in September 1964, and the construction contract was awarded on 2 November 1964. From awarding of contract to occupancy: 413 days. This may be a record for groundbreaking to completion of an NRAO construction project, beating out the 18 months each for the 85-foot and the 300-foot telescopes. The earliest documents in the Archives related to the planning for the building in Charlottesville are dated spring of 1963. NRAO took possession of the Charlottesville building just two months after the 140-foot telescope dedication, and thus the planning for the move began while NRAO was still struggling to resolve difficulties with the 140-foot construction. The building is on the University of Virginia grounds, and the University named the building Stone Hall. Long-time Administrative Assistant to the Director, Phyllis Jackson, is known to have received interoffice mail addressed to "Stone Hall Jackson."